Surrounded by a multitude of wireless networks, users can nowadays experience significant performance improvements when smartly combining multiple networks concurrently (e.g., for transferring files). This phenomenon is called Concurrent Access (CA). Some users, which are referred to as foreground (FG) users, are able to access and utilize multiple networks simulateneously. The traffic streams from the FG users are optimized over multiple networks, in the presence of background (BG) users that can use only one network. In the literature a variety of traffic splitting algorithms have been proposed, with a focus on improving the performance of the FG users, whereas the influence of smart traffic splitting on the performance experienced by the BG users, as well as the resulting splitting ratios over the different networks, have received hardly attention. 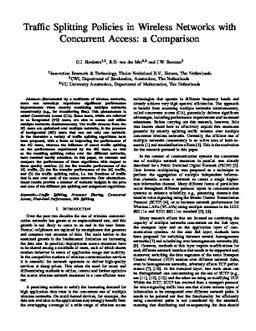 In this paper, we evaluate and compare the performance of these algorithms with respect to three quality metrics: (1) the file transfer performance of the FG traffic, (2) the file transfer performance of the BG traffic, and (3) the traffic splitting ratios, i.e. the fractions of traffic that is sent over each of the access networks. Our simulations based results provide a number of valuable insights in the pros and cons of the different job splitting and assignment algorithms.